Seed to Tree sind zurück in Berlin. 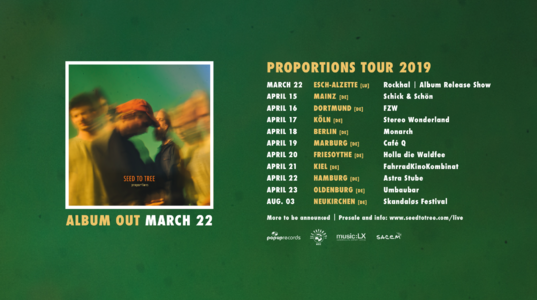 Coming from an inconspicuous country in the heart of Europe, Luxembourg band Seed to Tree developed from their folk roots into a dedicated indie-pop band reminiscent of acts like Bombay Bicycle Club and Ben Howard. An intimate voice intertwined with consistent grooves, broad guitar sounds, synth scapes and rich melodies, flirt along the lines of indie pop before meandering atmospheric folk shoegaze kicks in and envelops you. After releasing their debut album Wandering with over one million plays on Spotify, the music took Seed to Tree beyond Luxembourg’s borders, touring Germany and playing European showcase festivals including Reeperbahn Festival, and supporting international acts such as Beirut, The Temper Trap, Kodaline and Villagers. These experiences and new maturity clearly left their traces in the band’s recent sound. The new album, named "Proportions", sounds darker compared to their past work, leading to a musical world that is breaking with their traditional influences and questioning the emotional, intellectual and spiritual proportions within ourselves and society.